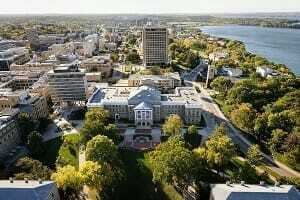 The University of Wisconsin–Madison has once again placed highly in the Academic Ranking of World Universities. The ARWU, conducted by Shanghai Jiao Tong University, ranked UW–Madison 28th in the world and 21st nationally. It is the third-highest ranking of any Big Ten school, behind the University of Michigan and Northwestern University. Last year, UW–Madison placed 24th worldwide and 18th nationally. Rankings are based on alumni and staff winning Nobel Prizes and Fields Medals, research performance, highly cited researchers and papers published in Nature and Science, articles indexed in the Thomson Reuters Science Citation Index Expanded and Social Sciences Citation Index, and per capita performance based on the size of an institution. Since 2003, ARWU has presented the world Top 500 universities annually based on transparent methodology and third-party data. More than 1,200 universities are ranked every year, with the best 500 published. UW-Madison has also performed well in other recent rankings. A report issued last month ranks the Wisconsin Alumni Research Foundation (WARF), the private nonprofit foundation that manages intellectual property on behalf of the University of Wisconsin–Madison, as 7th among the world’s universities in U.S. patents issued in 2015. The report, “Top 100 Worldwide Universities Granted U.S. Utility Patents,” by the National Academy of Inventors and the Intellectual Property Owners Association, credited WARF with 161 new patents. In July, Forbes magazine ranked UW–Madison as one of its Top Colleges in the United States. The university rose to 10th among public colleges, up from 11th last year, and 69th overall for the second year in a row. The ninth annual list includes 660 schools across the country. Forbes also ranks UW–Madison 34th among research universities and 10th in the Midwest. For the third year in a row, UW–Madison ranked 25th worldwide by the Center for World University Rankings. Nationally, UW–Madison placed 19th. Rankings by category include: patents, 14th; publications, 22nd; citations, 23rd; influence, 24th; broad impact, 27th; alumni employment, 29th; quality of education, 32nd; and quality of faculty, 32nd. In June, UW–Madison was recognized as one of only three public universities that made the top 10 list of colleges that produce the most Fortune 500 CEOs. The list, compiled by Money Magazine, uses data from the educational backgrounds of the recently released Fortune 500.